When I first highlighted that entry in the mortuary records, I didn’t have a photo of a tombstone to go with the name. Initial searches of historical newspapers yielded no results, but I did have some information about Fernald from other public records. From the 1880 census I learned that the Maine native was married to a woman named Julia and the couple lived on Main Street with their son Benjamin (aged 2) and two servants: Jane Simmons and Betty Millner. Fernald’s occupation was “Collector of Internal Revenue.” The wife turned out to be Julia Alberta “Berta” Gravely Fernald, a daughter of Henry County tobacconist Benjamin Franklin and Julia Thomas Gravely. William and Julia married in February 1877. 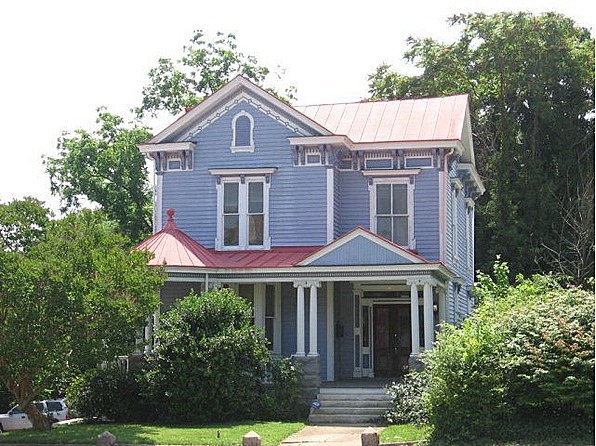 William & Julia’s home at 855 Main Street, as it looks in present times. Without any additional leads, I put my investigation of Fernald on hold for months. 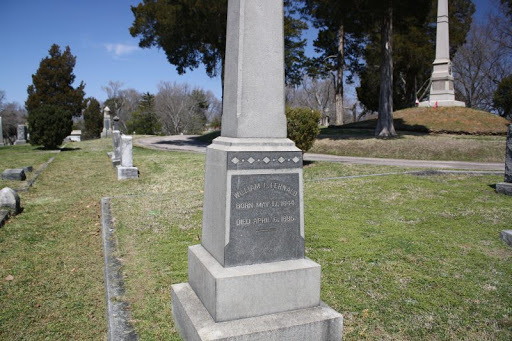 One day walking through Green Hill I noticed a large pedestal monument not far from the Confederate soldier’s monument, a prominent feature on the landscape. It didn’t make sense that William Fernald had such a large, eye-catching marker and so few references in the old newspapers so I decided to start digging again. Plus there was the whole “died in an insane asylum aspect” that I was curious about. Because of his political career as a revenue collector, Fernald’s name popped up in various online publications. On one occasion he “improperly collected” funds in the amount of $236.20 from the John R. Pace & Company. Whether or not that was a genuine mistake or an indication of something shadier, who knows. Some of the articles hinted that perhaps he wasn’t the most well-liked official in town, but then again who’s really happy about dealing with tax collectors? Smith didn’t respond to the telegram. Fernald explained that Dyer had confronted him at the courthouse and because he’d been jailed for breaking tax laws. W.H.H. Stowell, a witness to the confrontation, contacted the newspaper to set the record straight. 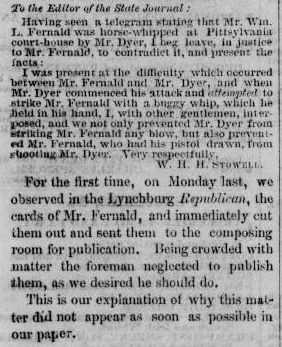 Dyer “attempted” to beat Fernald with his whip and Stowell and other men intervened. Fernald had pulled out his gun and Stowell thought that he would’ve shot Dyer had they not broken up the affray. In December 1882 Capt. Fernald had gotten into a physical fight with Col. J.B. Raulston, an assistant that he’d just fired. 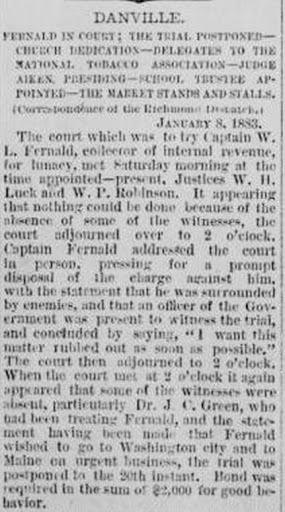 On January 3, 1883 Fernald was involved in another public altercation, this time with P.B. Gravely. Accounts of the incident vary, but it appeared that Fernald heard that P.B. had made offensive or false statements about him so he told Gravely to meet him at a certain time and place to discuss the matter, perhaps to even have a duel. When Gravely showed up, he made sure that no ladies were nearby before coming near Fernald. Fernald brandished his weapon but three men were able to take it from him. Gravely walked up to Fernald, who then hit Gravely across the head with a cane. Gravely responded by snatching a cane from one of the men who’d prevented him from getting shot and hitting Fernald with it. Before the matter of the fight was addressed in court, the judge wanted to wait until after the inquiry regarding Fernald’s possible lunacy. On January 8 Fernald’s lunacy trial was scheduled to begin, but they couldn’t proceed without several of the witnesses. Fernald made a paranoid statement to the court that he thought everyone was against him and that someone from the government was there to watch the trial. He was quoted as saying, “I want this matter rubbed out as soon as possible.” At the end of the day he was released on $2,000 bond until his case could be tried. He left soon afterwards for Washington and Maine. While I couldn’t find anything on the official outcome of Fernald’s hearing, there was a report later in the month that he had been deemed “hopelessly insane” by a Dr. Hammond and institutionalized in Washington. Fernald’s death notice indicates “softening of the brain” as his cause of death, which along with paresis, was another vague term used in the 19th century to describe a wide variety of neurological conditions. Based on my experience reading death records, softening of the brain was used as frequently as paresis. I also found information about a condition called “general paresis of the insane” which is associated with tertiary syphilis. GPI was also sometimes referred to as softening of the brain. I found nothing to indicate that Fernald’s condition was GPI instead of a more generic neurological condition, but thought it was worth mentioning. I wasn’t able to find out anything else about the “celebrated Halifax speech” mentioned in the death notice, but apparently Fernald was deranged when he gave it. A genealogical site lists that Julia died in 1939 of heart trouble at DeJarnette Sanitorium (named for eugenics advocate Dr. DeJarnette) in Staunton, Virginia. The circumstances of Julia’s hospitalization are unclear, but from what I’ve read the adult patients suffered mainly from mental illness or substance abuse issues. Julia was buried near her husband and her name appears on the monument.